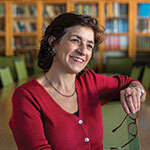 For me, kuku is a symbol of the Iranian diaspora kitchen. Some people make it with dill weed, some use cilantro, some use more eggs, some use walnuts instead of almonds. There are many variations of this Iranian national dish, but regardless it is a staple of Persian cooking; it is a vegetarian dish distinguished by its mix of herbs and greens cooked with eggs (for binding) and is served as both an appetizer or as part of a meal. 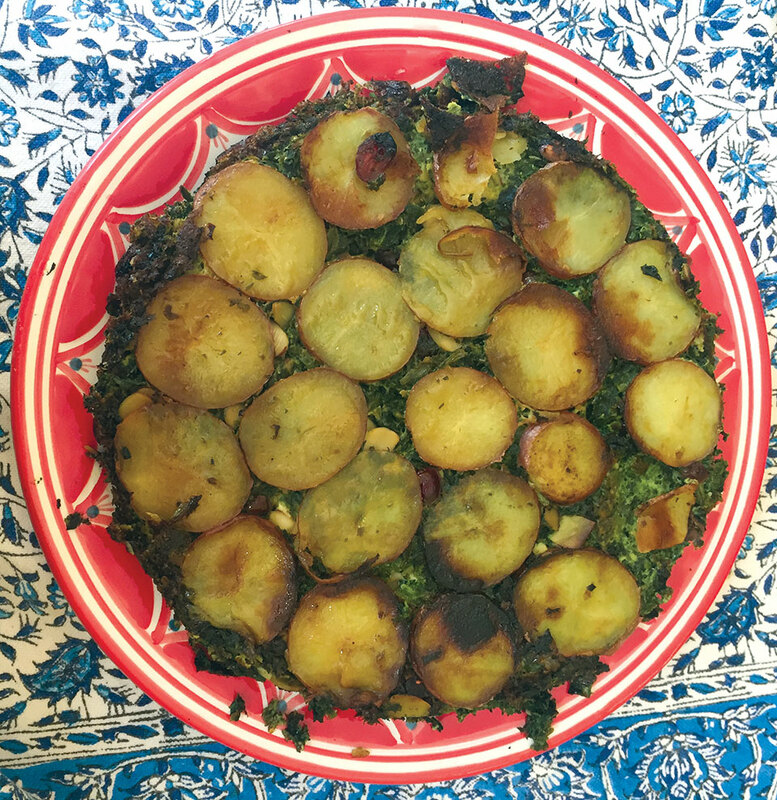 It is a delicious mixture of greens—modified by Persis with the following ingredients (cranberries and slivered almonds) and served with a crust of potatoes (on the bottom) that serves as tadigh (usually the crusty rice at the bottom of the pan). Begin by washing and destemming cilantro and parsley; especially parsley as stems can be large and more bitter. Chop finely with a big knife (alternatively, you can use a food processor to chop them). Wash and chop green onions to 1/4-inch circles and place in a hot skillet coated with olive oil. Add parsley, cilantro, fenugreek, and frozen or fresh spinach. Sauté on medium high heat for about 5 minutes (or until onions and spinach are softened). Add salt, pepper, fenugreek. Mix 5 large eggs in a large mixing bowl. After scrambling add the herb ingredients and stir until eggs are well mixed with herbs. Add almonds and cranberries and salt and pepper to taste. Before placing in a hot skillet (cast-iron works best), chop 2 medium red or Yukon gold potatoes in about 1/8-inch circles. Coat skillet with a generous amount of olive oil and also rub oil on sides of skillet. Place potatoes on the bottom of the pan so entire surface is covered with potatoes. Then add the herb mixture to a well-oiled pan. Cook on medium-high heat for about 10–12 minutes so that potatoes are softened and browned and herb mixture starts to cook. After about 10 minutes, place in the oven on high bake (400 degrees to cook slowly for about 20–30 minutes) or broil for about 10 minutes at a distance on the rack from heat source. Top should be well cooked. You will smell the cooking! Take a spatula around the perimeter of the pan to loosen the kuku from sides. If it is well oiled on the bottom, it should come out easily once you hold a dish against the pan and turn it over. Enjoy your Iranian diaspora kuku warm or cold! Serves about 8–10 people with 4-inch pie slices. Can also be served inside pita bread as a sandwich with yogurt and cucumbers.